For Taran Lichtenberger, high school honors biology was the first class where she began to understand science as a field of research and investigation. The curiosity the class sparked for her was in large part due to her teacher Katherine Konyar. “Mrs. Konyar found a way to integrate a real-world research experience into the classroom,” said Lichtenberger, a senior in Northwestern’s Weinberg College of Arts and Sciences. She recalls her class conducting a research project on the value of biomarkers and later presenting to other schools and representatives at Abbott Laboratories. “This was my first exposure to scientific research, and I am pursuing a career in research because of that experience,” Lichtenberger said. A teacher for more than 30 years, Konyar said her biology class is a conduit for helping students grow. In addition to teaching every day, Konyar works with the iBIO Institute EDUCATE Center’s Stellar Girls program, exposing girls in her community to science at an early age. Emily Moy has fond memories of her honors chemistry teacher dancing around the class as students sang the song he made up to help them learn about the ionic charges on the periodic table. Sometimes the song still gets stuck in her head. She still applies the basics taught by her teacher John Kretsos to the STEM courses she takes today. Kretsos coached Moy’s Science Olympiad team and helped her build a skill set beyond chemistry, giving her a strong foundation for her current engineering studies. He was always supportive and caring. Kretsos said teaching has been an ideal combination of his love for science and human interaction. It’s been a few years since Drew Bronson’s high school orchestra days, but he still plays his violin regularly. Once a self-proclaimed “hater of orchestral music,” Bronson said the influence of his teacher Mark Liu encouraged him to keep music a part of his life forever. In fact, Bronson, a senior at Northwestern’s McCormick School, said music makes him a more creative engineer. Liu, who received his master’s degree in music from Northwestern’s Bienen School of Music in 2006, said teachers must not only believe strongly in what they teach, but even more strongly in the people they teach. As a ringer for the Trans-Siberian Orchestra and armed with a Ph.D. in music education, Liu could teach at the college level or pursue a full-time career in music performance, Bronson said. Liu said his students often ask him why he enjoys teaching so much. McKeon appreciates Natalie Sekicky’s dedication to teaching and remembers how she, along with the principal’s help, would scrape money together to send the “Shakerite” high school newspaper staff to journalism conventions where, over the years, they came back with many awards. It’s important for Sekicky to instill in her journalism students that they must use their great powers for good. One has already gone on to win two Pulitzer Prizes for reporting. McKeon, who calls Sekicky the “finest high school journalism teacher in the country,” said she taught him to not only write clearly, but to think clearly. Whether reading Shakespeare’s “King Lear” or Toni Morrison’s “Song of Solomon,” Allison Mark said her AP literature teacher pushed her to think deeper, teaching her skills to engage with and analyze literature. “Papers were handed back just days later, inked over with insights and constructive criticism, and college application essay readings outside of class were scheduled every week in the fall semester,” Mark said. Furthermore, she remembers Wu returning soon after the birth of her second child for some last-minute AP exam coaching and preparation. Wu said it’s her job to create the conditions necessary for all students to learn to the best of their ability every day. Wu’s high standards and unshakeable faith in her students taught them to only expect the best in themselves, Mark said. “Ms. Wu, the superwoman that she is, truly cared for us and found time to knit us closer together as a class,” Mark said. Weinberg College of Arts and Sciences senior Barbara Gawin said English teacher Dana DesJardins goes above and beyond in her role as an educator. “Throughout the year, she frequently met with all her students to check in with them,” Gawin said. “On the last day of class, she handed out poems that she had found and specifically chosen for each of us. Mine was so beautiful and such an accurate description of me that I almost cried." DesJardins has been a public school teacher for 26 years. She said even after interacting with thousands of students over the years, they still surprise her. “They still remind me it is imperative to be open and flexible, to read the emotional weather in the room and adapt accordingly,” she said. Sanlida Cheng, director of humanities at Niles West, would also add thoughtful and considerate to that list of qualities — particularly as it pertains to DesJardins. Cheng said DesJardins recently offered to teach a section of junior English as a favor to a colleague. Arielle Ticho said history teacher Andrea Geyling-Moore taught her to look at the world through a critical social justice-oriented lens, inspiring the School of Education and Social Policy senior to commit to a career in urban teaching. [She] “made sure to make the topics we read about and discussed in class come alive through inviting speakers to class and having us interact with the world beyond the classroom walls,” Ticho said. When Geyling-Moore first started teaching, she began with an international focus. However, she said teaching and living have taught her the importance of also focusing locally. “Indeed, investing oneself locally can have significant connections with national and global issues, as I try to help my students realize, and as my students’ own stories often exemplify,” Geyling-Moore said. Geyling-Moore, who has taught at Milton Academy since 1992, has developed a social justice course in which students explore issues of human rights, living wage, environmental justice, food insecurity and more. She requires students to make a weekly commitment to a service site off campus. Vivian Wu Wong, chair of the history and social sciences department at Milton Academy, said Geyling-Moore’s class indeed has had an impact on her former students. “As we continue to hear from our alumni, these experiences were incredibly meaningful and continue to shape their outlook on the world today,” Wong said. But Yim’s math teacher David Masunaga, a 1979 graduate of Northwestern, inspired Yim and his two brothers, now also Northwestern graduates, to pursue diverse educational learning experiences far from Hawaii. Furthermore, Yim said Masunaga believed students should show concern and do for others. Paying it forward, Yim has tutored students in several science courses at Northwestern and has served as a basketball coach for fourth-graders at an Evanston community center. Aster Chin, the upper school dean at ‘Iolani School, said Masunaga is one of the most revered members of their faculty. Ben Weiss, a senior at the School of Education and Social Policy, said he likely would have quit high school orchestra after his freshman year if it hadn’t been for his music teacher, Patrick Pearson. Allan Dennis, founder and president of the Midwest Young Artists Conservatory, said it’s hard to think of anyone more deserving than Pearson for this honor. “His commitment to his students, as a role model and because of his commitment to youth, especially to providing opportunities for youth who might not have the support system that other students might, make him a most logical choice for this wonderful award,” he said. To Osbeyda Navarrete there is one high school teacher in particular who stands out and remains a constant source of support and motivation. English teacher Raymond Salazar challenged and pushed his students to continue to do their best, Navarrete said. Since graduating from high school, Navarette has from time to time consulted with his former mentor to discuss matters such as career options. Salazar said so much of his work is helping students realize the strength they already possess, but he also recognizes they are not invincible. Karen Boran, principal of John Hancock College Prep High School, said all of Salazar’s achievements in the classroom still do not cover his impact. “He pushes kids to think deeper, to work harder and to become their best possible selves,” she said. Weinberg College of Arts and Sciences senior Ryan Kenney said English teacher Daniel Conti tirelessly guides and supports his students until they have the confidence and capability to meet his expectations. “By prioritizing learning over achievement and by imparting his passion for learning and teaching at every opportunity, Mr. Conti demonstrates his exceptional ability to foster a love of learning among all of his students,” Kenney said. Conti, who has taught English at Lincoln-Sudbury Regional High School in Sudbury, Massachusetts, since 1994, said early on in his teaching career he learned that teaching wasn’t about him, it was about the students -- after which he said many more lessons have followed. Conti is “a true servant leader to his students,” Kenney said. “I had many friends in Mr. Conti’s classes who weren’t exceptionally drawn to English as a subject, but who nonetheless matured as students and gained remarkable confidence in themselves and their abilities by simply being a student in Mr. Conti’s class,” he said. Eleanor Burke, housemaster at Lincoln-Sudbury Regional High School, has supervised Conti’s teaching for seven years and said he is a teacher who literally opens students’ worldview. “Every time I watch Dan’s class, I see small miracles,” Burke said. “We all leave the room feeling something is right with the world." “It tells me that I have orchestrated a communal learning experience that caused time to fly by,” said Ford who teaches chemistry and AP chemistry, as well as an elective environmental science class for juniors and seniors, at The Seven Hills School in Cincinnati. Ford’s passion for teaching and joy for learning is contagious and evident to her students, said McCormick School of Engineering and Applied Science senior Katherine Cirulli, citing how Ford has transformed the way she thinks about and solves problems, both inside and outside of the classroom. Ford said that’s by design. “I use music, special lighting, costumes, props and poetry to connect all of their senses to chemistry,” she said. But props aside, her courses are known to be so challenging that students adjust their course loads around them, said Susan S. Marrs, assistant head of school at Seven Hills. Hartnell, who has been teaching for 15 years, said students need to “buy in” to what you’re essentially “selling” them. Hartnell also is known for his blue book exams. “Although daunting at first, Dr. Hartnell’s blue book whipped my writing and study skills into shape at a time in my life when I was determining what type of student I wished to become,” Feder said. “His course shaped me not only as a student but also as a person, and I do not believe that I would have developed the same skills and self-motivation had I not spent that time in his classroom,” she said. Students should always be the focus of teaching, Hartnell stressed. His hands-on approach to teaching -- using costumes, reenactments or protests -- benefits all types of students regardless of their unique abilities, he said. “This produces students that are excited about education and creates a wonderful atmosphere not only in Room #135, but around the high school and community,” Hartnell said. McCormick senior Rene Romo said his high school calculus teacher Barbara Kane managed to get an entire class excited about a subject and to strive for the same goal. Kane’s ability to motivate her students led to a high of more than 75 percent of AP Calculus students at Morton East High School in Cicero, Illinois, passing the AP exam in 2013, which is 15 percent higher than the national average. That is especially noteworthy considering the school regularly falls below state standards in math. Romo said what differentiates Kane from other teachers is the amount of work she’s willing to put in to ensure her students have all the resources they need. She provides tutoring and homework help every day before and after school and even comes in on Saturday in order to have students complete AP practice exams. A math teacher at Morton East since 1998, Kane said along the way she has developed techniques to demonstrate multiple ways to solve a problem and to identify the better or easier approaches. She’s also come to realize that the goal of teaching is not entirely about math. For most of her life, Weinberg senior Thelma Godslaw grew up within a three-block radius of Lawndale, Hawthorne and Inglewood, California. She was content with the parameters of her immediate neighborhood -- that is until she set foot in Jose Romo’s Spanish class. “I had never seen the beach, until I ran there with my two feet on our training routes,” recalls Godslaw, referring to her experience with “Students Run L.A.,” an organization that gives at-risk students the opportunity to prepare for running a marathon, which was coached by Romo. Romo, who teaches Spanish and AP Spanish literature at Leuzinger High School in Lawndale, went above and beyond to expose his students to the Latin culture through books, dance, music, art, plays and much more. In addition to coaching “Students Run L.A., he organized the annual Cinco de Mayo celebration and advised the Movimiento Estudiantil Chicana/o de Aztlan chapter at Leuzinger, showing Godslaw and other students how to stand up to injustice. Inside Romo’s classroom, Godslaw not only learned to speak, read and write Spanish, she also fell in love with the culture of her Latina and Latino peers. Romo strongly believes the true test of his teaching is not when students do well on an assessment, but when they go out into the real world and put into practice what is most appropriate. At Illinois’ Buffalo Grove High School, orchestra teacher Elizabeth Bennett has earned the nickname “Mom” as a term of endearment. Weinberg College of Arts and Sciences nominator Samantha Bulmash, who nominated Bennett for the award, said, “She has become ‘Mom’ to hundreds of students. It takes an exceptional type of person to earn such an affectionate nickname from ‘angsty’ teenagers, and she earned it without even realizing it.” A teacher at Buffalo Grove for nearly seven years, Bennett was the recipient of the 2008 Illinois Emerging Teacher Leader Award and the 2014 recipient of the University of Chicago’s Educator of the Year Award. Bulmash said Bennett manages to achieve that perfect balance between education and pleasure, strictness and friendliness, precision and creativity. “Everything about Mrs. Bennett demonstrates her love for music: her speech, her stories, her behavior, even her clothing -- she is extremely proud of her ‘Bach socks,’” Bulmash said. “She implemented an orchestra service hour requirement so that we can give back to our community and bring the joy of music to younger students or other community members.” Bennett embraces the “Mom” nickname -- especially now. “After becoming a ‘real’ mom, I’ve learned that this craft of teaching is very special and a gift not to be taken for granted,” Bennett said. “Each day there are parents who entrust their children to me, to mold their young minds and help them discover the world around them and how to not only survive in it, but thrive.” Bennett earned her bachelor’s degree from Northwestern and her master’s degree from Concordia University in Wisconsin. Getting through school always came easily to Medill School of Journalism senior Lissette Rodriguez until she encountered high school journalism teacher Donald Bott, who never failed to challenge her. “Mr. Bott saw greater potential in this first-generation, low-income, Mexican-American girl,” Rodriguez said. “And I’m not the only one he saw potential in. He has seen and continues to see promise in every single one of his students over his nearly 30 years of teaching.” Bott made certain Rodriguez knew the ins and outs of applying to college and called her parents to go over the application process. As a teacher at Amos Alonzo Stagg High School in Stockton, California, where four out of five students qualify for the federal free lunch program, Bott crafts lessons that show compassion for students while continuing to push them to be great. Over the course of his teaching career, he has discovered the reciprocal nature of teaching. “Yes, I, the credentialed teacher, have a great deal to offer, but students also bring a rich treasure to the classroom,” Bott said. “This principle has helped me develop my craft as an educator.” Bott has been recognized with several awards over the years, including the San Joaquin County Teacher of the Year and most recently with the Diversity Award from the Journalism Education Association. He earned his bachelor’s degree from the University of California, Santa Cruz, and his master’s degree from Sacramento State University. In Wesley Kirpach’s classroom, curiosity is sparked before the high school teacher even sets foot in the room, says Weinberg College of Arts and Sciences senior Laura Stoughton, who nominated the Plano West Senior High School biology teacher. Stoughton describes skulls and skeletons that sit atop wooden cabinets in the class and award-winning wildlife photographs, taken by Kirpach, taped to the doors. Stoughton says Kirpach’s undeniable passion for biology infects even the most reluctant student, creating an environment in which his students not only learn about science, but also participate in it. “He has the ability to make complex, abstract processes comprehensible and concrete,” Stoughton said. “Any student of Mr. Kirpach’s knows that his favorite props -- a set of squishy Lego blocks and bendable foam tubes -- could morph into proteins, glucose molecules or DNA, as that day’s lesson required.” Kirpach said his greatest influence was his own high school biology teacher, who instilled in him a love of biology, science and learning. “I take every opportunity possible to put the science into the hands of the students and let them experience biology first hand,” Kirpach said. “Discovery is fundamental. It is the most exciting and engaging aspect of science.” His goal is to “instill a curiosity in his students, so that they are prepared to be competent navigators in their own adventure.” Kirpach earned a bachelor’s degree from Texas A&M University and has received numerous honors, including Excellence in Teaching, Teacher of the Year Award Plano and Plano West Teacher of the Year awards. School of Communication senior Brittany Ray does not believe she would even be graduating from Northwestern in June if not for her high school history teacher Valerie Schrag. More than a “great teacher,” Schrag, who teaches African-American history as well as AP U.S. history and modern world history at Lawrence High School in Lawrence, Kansas, mentored Ray through the college application process and encouraged her to apply to Northwestern. “My freshman year at Northwestern was marred by extreme homesickness, and as I’d always done, I turned to Ms. Schrag for advice and guidance,” Ray said. “I felt out of my element and unsure if I had made the right decision. However, she continued to encourage me and reassure me that it would get better -- once again, she was right.” Schrag said as a high school teacher, she helps students navigate not only their academic progress but also their journeys toward fulfilling adult lives, adding that she’s come to understand that all victories are worthy of acknowledgement, not just those that are widely recognized by others. “It is important to congratulate the student who earned a ‘5’ on the national AP U.S. history exam, but it is equally as important to celebrate with the student who faced his fears and simply sat for the exam or enrolled in the course in the first place,” Schrag said. “She epitomizes what the secondary school teacher award represents, and I have waited four years to nominate her,” Ray said. Schrag earned a bachelor’s degree from Bethel College in Newton, Kansas, and a master’s degree from the University of Kansas. School of Education and Social Policy senior Samantha Paige Yi begged her high school counselor to allow her to take an extra English class her senior year. However, she needed four years of math to apply for early decision at Northwestern. Yi said she can still remember the first day she walked into her calculus class at Packer Collegiate Institute in Brooklyn, New York, and was greeted by the most enthusiastic teacher she had ever encountered -- Sameer Shah. “What really got me was when he talked about how beautiful calculus could be,” Yi said. “Mr. Shah never hesitated to point out the overlap between subjects -- math and music, science and English.” Shah said that friends and colleagues say he’s “unnaturally obsessed with teaching.” “For me, it’s a badge of honor,” Shah said, adding that at the heart of it all, he holds his students to a high standard. “I always meet them where they’re at -- altering my curricula based on the understandings I see -- but I make sure they lead me to deep mathematical understandings, rather than the other way around,” he said. Bruce Dennis, head of school at Packer, says the depth of Shah’s intellect led the school to take a chance on the then first-year teacher -- something they rarely do. “As a reward for our risk-taking, Sam has affirmed the wisdom of our decision to hire him each and every day over the past eight years,” Dennis said. Shah earned his bachelor’s degree from the Massachusetts Institute of Technology and his master’s degree from University of California, Los Angeles. At Illinois’ Highland Park High School, Howard Hill is sometimes called a “salesman of science.” Weinberg College of Arts and Sciences graduate Kathryn Halpern, who nominated her former environmental science teacher for the award, says that Hill not only has ignited an interest in environmental science in hundreds of high school students but also equipped them to live more ecologically friendly and sustainable lives. A teacher at Highland Park for 14 years, Hill won a 2012 Presidential Award for Innovation in Environmental Innovation from the U.S. Environmental Protection Agency and The White House Council for Environmental Quality. From the very first day of class, his students find themselves doing field research out-of-doors in their efforts to conduct real-world environmental research. To explore the ways in which their school can reduce its carbon footprint, Hill’s students designed and built a biodiesel laboratory that converts used vegetable oil from the school’s cafeteria into biodiesel fuel that powers a generator. In turn, the generator powers the school’s athletic concession stands. While teaching his students about alternative energy, Hill encouraged them to explore the feasibility of a wind turbine at the school. Today a wind turbine provides additional green power. Hill earned his bachelor’s of science degree from the University of Guelph and a master’s from Northeastern Illinois University. His goal is to make his students realize that they can make positive and innovative contributions to issues of sustainability and environmental quality. According to his former student, he is successfully doing just that. As a senior at Chicago’s Northside College Prepatory High School, Bridget Illing -- a graduate of the School of Communication -- took an elective with world studies and European history teacher Catherine Irving. To better understand the nation’s increasing rates of obesity and decreasing health levels, Irving took Illing and nine other students to her hometown of Huntington, West Virginia, which an annual Gallup index of well-being ranks as the nation’s “fattest city.” Meeting with people from different disciplines, they learned how economic forces influence local culture. To study the history of Haiti, her students read “Breath, Eyes, Memory, ” a 1994 novel about a young girl who moves from an impoverished village in Haiti to New York. They later Skyped with the book’s author, Edwidge Danticat, and talked about the ways that history influences current events: “Ms. Irving has a teaching style that is so enthusiastic and creative, there is no way to find anything about history uninteresting,” says Illing. “Each new lesson is like learning a great piece of gossip about who did what to whom.” Irving, who earned a bachelor’s degree in history at Miami University of Ohio and a master’s degree in teaching arts from Marshall University in West Virginia, says her goal is to engage all students. “As social science teachers, we are able to use content to encourage future decision-making. I take this privilege very seriously,” says the 18-year veteran of teaching. David Knight’s philosophy of teaching has evolved over the course of 24 years at University High School in Irvine, California. According to Weinberg College of Arts and Science nominator Jane Wang, her biology teacher’s strong points include the ability to “bring back the childlike wonder and fascination” of learning. In his application, Knight describes the degree to which he connects with his students as they experience not only joy and success and undergo tragedy and difficult circumstances. “Through my students’ eyes, I have seen the grief of divorce, the joy of being accepted to college” and just about everything in between. He says he not only has the “responsibility of teaching science to his students, but the obligation to model integrity and fairness, responsibility and absolutes.” Knight is most gratified when former students tell him that his were the hardest but also most rewarding high school classes they took. “For good or bad, I can influence these minds with both my words and my actions,” he wrote in his award application. “Not only am I teacher of science, I (also) am a molder of character.” Knight earned his bachelor’s degree in science education from Oregon State University and his master’s degree in environmental studies from California State University-Fullerton. A teacher at University High School since 1990, he has taken many interested students on field trips to Central and South America to study tropical ecosystems. Northwestern’s Wang was among them. Phillip Baker is a 20-year veteran of business and engineering management turned National Board-certified science teacher. Baker currently is a chemistry and physics teacher at Huntsville High School in Huntsville, Ark. He was nominated for the Distinguished Secondary School Teacher Award by McCormick School of Engineering and Applied Science senior Tristan Sokol. Sokol writes that “Mr. Baker taught us not only about chemical potential but about the great potential each and every student had. His impact on my life is the direct cause for me and my classmates going to top-tier universities across the country, from a town that had only seen a handful of students ever travel outside the state.” Baker has been integral in developing and implementing rigorous curricula into the Huntsville High School science department to increase the likelihood of student success. He received his B.S. in chemical engineering from the University of Arkansas, completed the executive program at the University of Michigan Business School and achieved National Board Certification in 2010. Kelly O'Keefe-Boettcher is an American Authors and International Baccalaureate English teacher from Rufus King High School in Milwaukee, Wis., who can make a teenager feel like her classroom is the best place to be every day for 52 minutes, according to nominator Jessica Holden. Graduating from the School of Education and Social Policy in June, Holden nominated O'Keefe-Boettcher because "there will always be a young, confused, unloved, ignored, hidden beauty and talent of a student that Ms. O'Keefe has the power to make whole again." She challenges her students to read and write critically while showing her caring and respectful attitude towards everyone she is in contact with throughout her day. O'Keefe-Boettcher received her B.A. and M.A degrees from the University of Wisconsin-Milwaukee in 1987 and 2002, respectively, and her teaching license from Alverno College in 1998. David Quinn is a teacher of English and the theory of knowledge at Edmonds-Woodway High School in Edmonds, Wash. He was nominated for the award by McCormick engineering senior Taiyo Sogawa who credits Quinn with teaching him to think critically, a skill which he is able to apply to his work in computer engineering. Quinn, who takes a student-centered approach to teaching, also served as a mentor for Sogawa in and out of the classroom. He rarely stands at the front of the classroom, reflecting a style that allows students to guide the learning. Quinn asks, “Why are my questions about a text more important than my students’ questions?” Sogawa indicates “Mr. Quinn did not simply tell me to follow my dreams; he was and is a living example of someone who has found his passion and refused to let the normal expectations of who teaches high school stand in his way.” Before becoming a teacher, Quinn was an actor, whose credits include hosting the Primetime Emmy-nominated science series "3-2-1 Contact" and winning a Peabody Award as the host of "I Have AIDS, A Teenager’s Story" (a chronicle of Ryan White). He has made regular appearances in national commercials and was a child actor on "Sesame Street." While teaching, Quinn co-founded Allrecipes.com, now the No. 1 food website in the world, and served as its chairman until 2006. Since joining Edmonds-Woodway High School, Quinn has become the coordinator of the International Baccalaureate (IB) program and increased full-IB diploma registration by 100 percent since 2011. Julianne Schrick is a nationally board-certified high school mathematics teacher with more than 25 years of experience. She has been teaching at Redwood High School in Larkspur, Calif., since 1995. Her teaching philosophy is based on instilling in students, regardless of their backgrounds or aptitudes, a belief that they can take on hard challenges and succeed. This belief is exemplified by the four students who collaborated on her nomination: Danielle Littman and Rachel Abrahams, both in the School of Communications, and Jonathan Kaplan and Daniel Kaplan, both in the Weinberg College of Arts and Sciences. They wrote that Schrick would “believe in us until we believed in each other and until we believed in ourselves.” Over the last six years, more than 80 percent off her AP Calculus BC students have received a score of 5. Schrick received her B.A. in mathematics and M.S. in education from Dominican College of San Rafael. 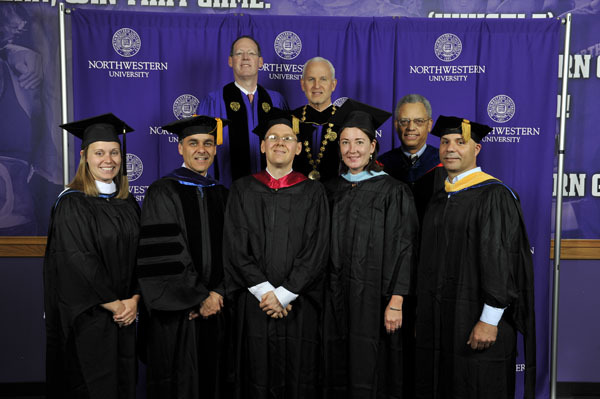 Winners of the 2012 Distinguished Secondary School Teacher Award with President Schapiro, Special Assistant to the President Eugene Lowe, and Commencement Speaker Paul Farmer. Rafeal Arechabelata an honors and AP physics teacher at University School of Nova Southeastern University in Ft. Lauderdale, Fla., was nominated by five Weinberg College of Arts and Sciences seniors. Michael Dornbusch, Jonathan Schwartz, Matthew Adam Bartnovsky, Mitchell Drew and Kelly Flowers each expressed admiration for their Cuba-born teacher who received his undergraduate degree in the former Soviet Union. Of his own teaching philosophy, Arechabaleta says: “Education provides students the latitude to form their own opinions and to challenge themselves and society around them. Having been educated in Communist Cuba where free thought was discouraged and educational resources were limited, I truly appreciate educational freedom and strive to provide my students the opportunity to design their own curriculum.” He is the second teacher from University School of Nova Southeastern University to be awarded the Distinguished Secondary Teaching Award. 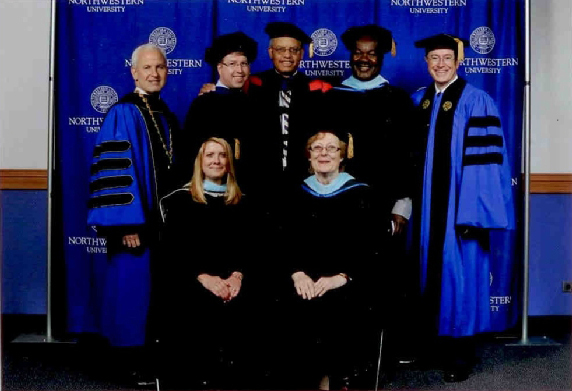 Winners of the 2011 Distinguished Secondary School Teacher Award with President Schapiro, Special Assistant to the President Eugene Lowe, and Commencement Speaker Stephen Colbert. Theresa Fischer teaches AP Economics and American Government and Politics at Ridgefield High School in Ridgefield, Conn., and is the advisor for Model UN. “During my time at Northwestern as an economics major, I have found that Ms. Fischer’s AP Economics class prepared me very well for collegiate academics,” said Nicole Marie Ablondi, a senior in the Weinberg College of Arts and Sciences. “AP economics and Model UN were without doubt some of the most challenging and most rewarding of all my high school experiences,” she said. “At the end of my high school career, I learned more than how to find the deadweight loss on a graph or research a topic for a debate -- I learned how to believe in myself and what I could accomplish. Fischer is widely acclaimed for loving what she does and truly caring about her students,” Ablondi said. Stohr heads up the freshman honors program in the English department and is an adviser for the yearbook at LaSalle-Peru Township High School in LaSalle, Ill. “Ms. Stohr teaches her students much more than Greek mythology or Adobe InDesign,”said Samantha Rose Reed, a senior in the School of Education and Social Policy. “With honesty and respect, she coaches them through some of the most difficult and formative years of their lives.” The countless hours Stohr worked before and after class, particularly in her advocacy for the yearbook, also was noted by Reed. Each year she takes the yearbook staff to camp in the summer, prepares them for journalism competitions and submits their work for scholastic recognition. “I still have coffee with Georgia Stohr or visit her classroom whenever I go home for a few days….she has become as much my friend as my teacher,” Reed said.